In 1901 Amy and James Archer opened Sister Amy’s Nursing Home for the Elderly at Newington, Connecticut. Their chosen clientele was the wealthy and the Archers gained a reputation for the quality of their care, despite neither having any medical qualifications. In 1907 they moved to larger premises in Windsor, and opened the Archer Home for the Elderly and Infirm. In 1910 James Archer died and his widow carried on running the home alone until 1913 when she married Michael W. Gilligan, a wealthy widower. He died not long afterwards. Then strange happenings began at the home —inhabitants began dying despite being healthy. Franklin R. Andrews signed an agreement allowing Archer-Gilligan to take money from his account for his care and died on 30 May 1914. He had been in good heath. Residents had to pay $1,500 up front for a promised lifetime of care in the home but soon afterwards many of them died; the rate was estimated at ten deaths a year, six times greater than the average for the area. There were 48 deaths in a five-year period. Archer-Gilligan was hoping that the authorities would not notice, especially since her local doctor, Howard King, was signing the death certificates as natural causes. Among the victims Charles Smith was poisoned on 9 April 1914, Alice Gowdy in December 1914 and Maude Lynch died on 2 February 1916. Finally, the police did take notice and two bodies were exhumed, including that of Michael W. Gilligan. Both were found to contain very high levels of arsenic. 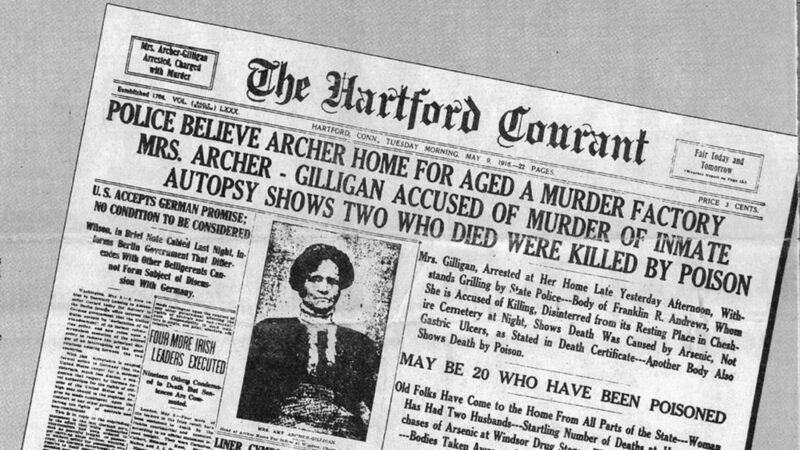 Amy Archer-Gilligan was arrested and in June 1917 went on trial in Hartford, Connecticut. The prosecution showed that she had bought large quantities of arsenic, the poison found in the bodies of her victims. She claimed that she was devoted to her church and to the nursing profession. It cut no ice and she was convicted of five murders and sentenced to death. Her lawyer engineered a retrial in June 1919 and she was again convicted and sentenced to life imprisonment. She died aged 59 in 1928 while incarcerated in an insane asylum.